All group registrations will be billed on one invoice. Groups must register on one form, at the same time. Institution is defined as in the same physical location. 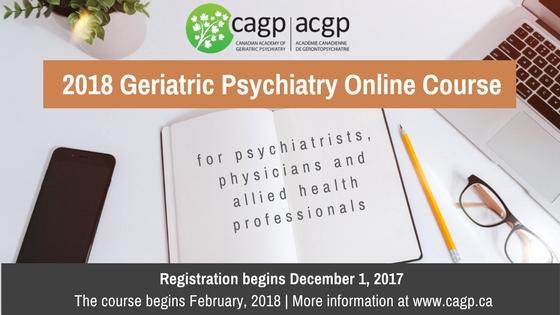 The 2018 Geriatric Psychiatry Online Course will consolidate learning of geriatric psychiatry in an innovative, interactive, and fun manner. Our program is geared to psychiatrists, physicians, allied health professionals and residents who are interested in up-to-date learning about the psychiatric care of the elderly. The course features interactive asynchronous online learning (sign on at your convenience). This 3-month course, comprised of 13 one-week modules, is led by expert faculty and covers a wide array of topics in geriatric psychiatry at an advanced level. This year, three course modules will feature an added bilingual component (with the option to have discussions en français), thanks to the facilitation of Dr. Jean-François Côté and Dr. Julie Theriault. The course will be co-chaired by Dr. Mark Rapoport, CAGP President Dr. Dallas Seitz and Dr. Andrew Wiens. Please note, participants will receive their log-in information immediately prior to the course start date. Cancellation Policy: cancellations will only be accepted on or before January 29, 2018. No credits or refunds will be given for cancellations received after January 29, 2018.